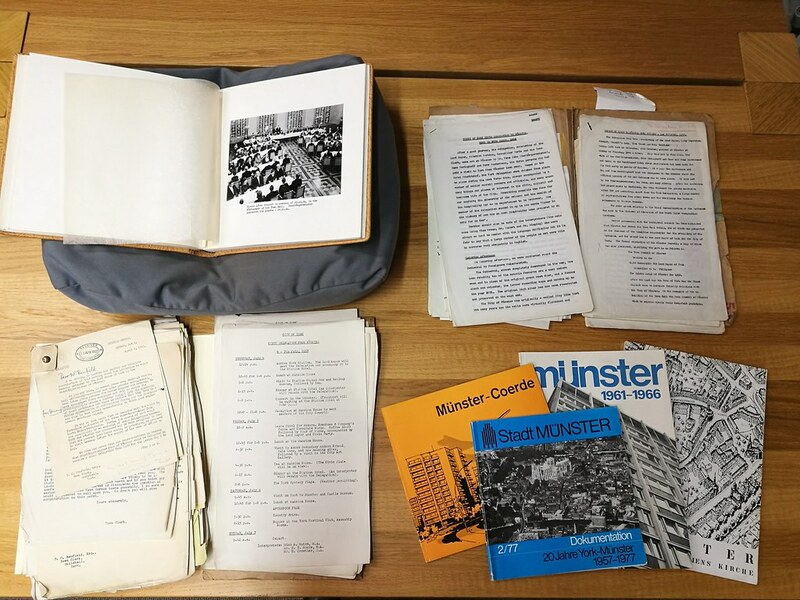 The York-Münster Memory Book Project: 60 years of twinning. July 2017 marks the 60 year anniversary of the town twinning between York and Münster. The idea for this project was created by Explore York Libraries and Archives and the Civic Office with the aim of creating a digital archive of the memories and experiences of the people of both cities who have taken part in visits and exchanges since 1957. Archives related to the York-Münster twinning held at Explore York Libraries and Archives. York Explore Archive holds a small archive of material relating to the history of the York-Münster twinning. This includes correspondence regarding the initial proposal from the Foreign Office to York to take part in an exchange with Münster and the subsequent arrangement of initial visits by civic delegations from each city to the partner city. However, as well as civic exchanges, there have been many exchanges between organisations and individuals from York and Münster over the past 60 years and a mutual sharing of a range of skills and interests, particularly in the areas of culture, language, education, agriculture, music and sport. This wide and varied range of people and organisations across both cities have contributed to the cementing of a meaningful relationship between York and Münster. We invite all who are interested to contribute their memories, in the form of written recollections, audio recordings, videos, personal photographs of visits, photographs of objects or ephemera related to their experiences in York or Münster. Contributors are encouraged to delve into their recent or distant past, open their own Yarn account, share their stories, videos or photographs, expand on or comment on existing stories and interact with friends, old and new. 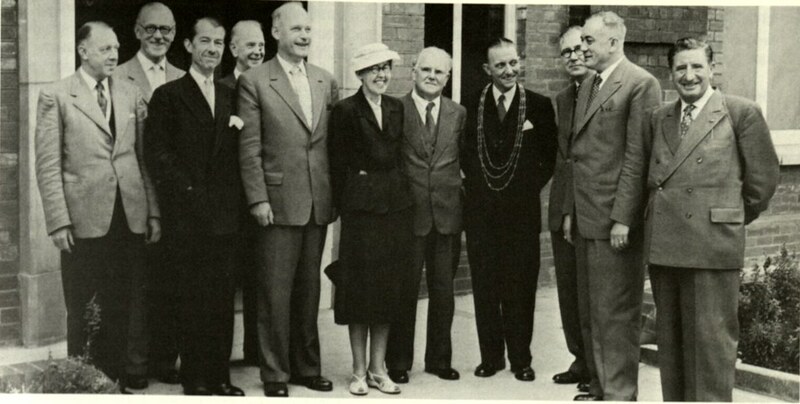 First visit of a Münster civic delegation to York on 6 July 1957. Here at a reception given by Lord Mayor Eric Keld (seen here with Chain of Office. Second from right is Oberbürgermeister Dr. Peus and 5th from left is Town Clerk Heinrich Austermann. The UK Foreign Office made a big effort to encourage town twinning between cities in the UK and cities in Germany following World War II when it was felt that establishing links between local communities of former enemy countries would promote healing and contribute to a more secure peace in Europe. The York-Münster twinning was one of the first partnerships to emerge from this initiative. 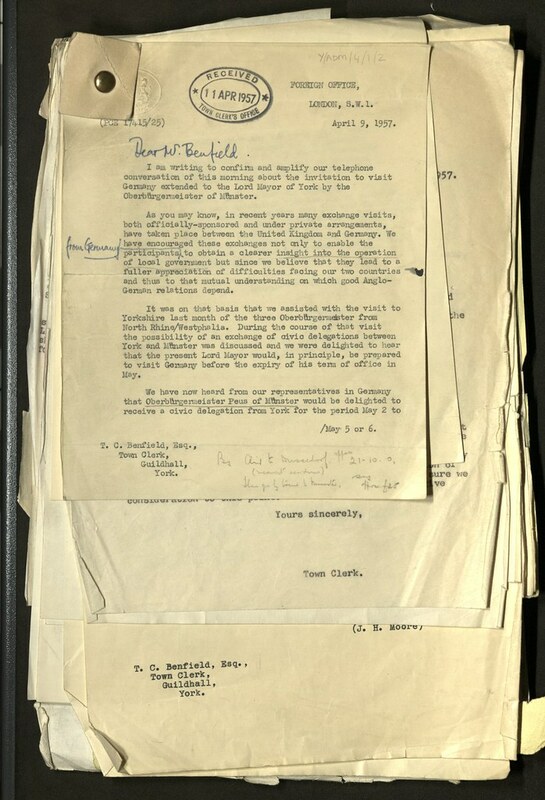 Explore York Libraries and Archives holds in its collections an archive which includes correspondence detailing the first contact between the German Information Department at the Foreign Office and Tom Cecil Bedford, York's then Town Clerk. Initially it was proposed that an exchange take place between the two cities, as part of a greater nationwide effort to enable participating towns to 'obtain a clearer insight into the operation of local government and a fuller appreciation of difficulties facing our two countries'. Münster and York were suggested as partners due to their 'similar characteristics', which include their both being University towns, steeped in history with magnificent cathedrals dominating their skylines. The initial invite was extended by Münster's Oberbürgermeister, through the Foreign Office, inviting a civic delegation from York to visit Münster in May 1957. 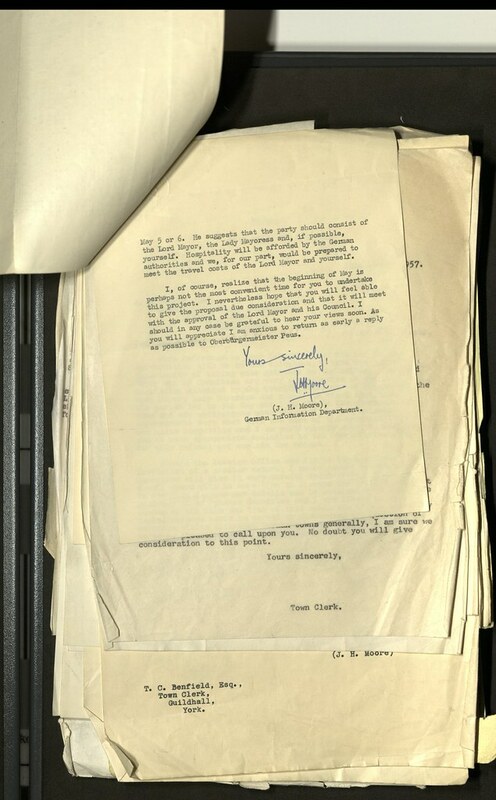 However, they were unable to accept due to short notice, so the first exchange that took place was when a civic delegation from Münster attended York Festival in July 1957. The first letter from the German Information Department to York's Town Clerk, Tom Cecil Benfield in April 1957, suggesting an exchange between York and Münster. 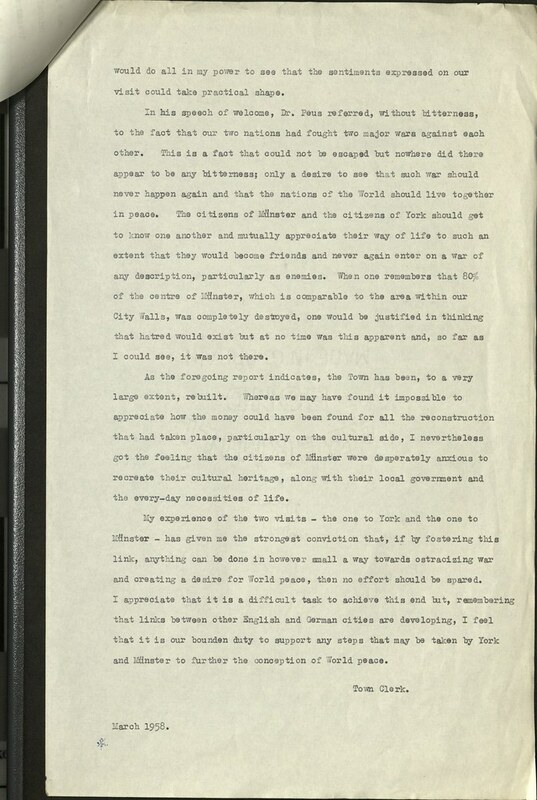 Page 2 of the first letter from the German Information Department to York's Town Clerk, Tom Cecil Benfield in April 1957, suggesting an exchange between York and Münster. 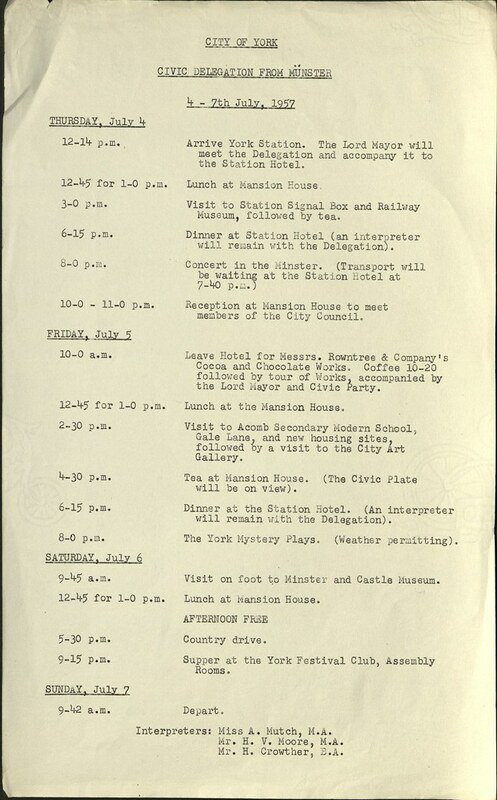 Schedule of activity for the first visit of a civic delegation from Münster to York for the York Festival in 1957. 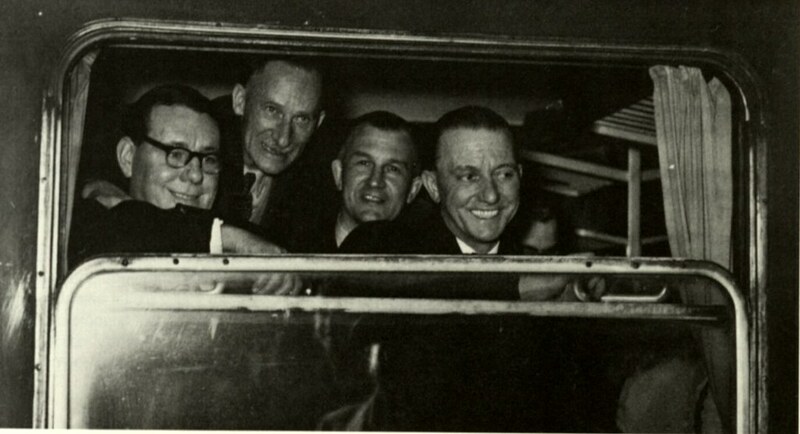 The first Delegation from York is seen off from the Main Station Münster on 25 March 1958. From left: Councillor Burke, Alderman Scruton, Town Clerk Benfield and Lord Mayor Keld. Page 1 of a report written by the Town Clerk about the first visit of a York civic delegation to Münster in March 1958. 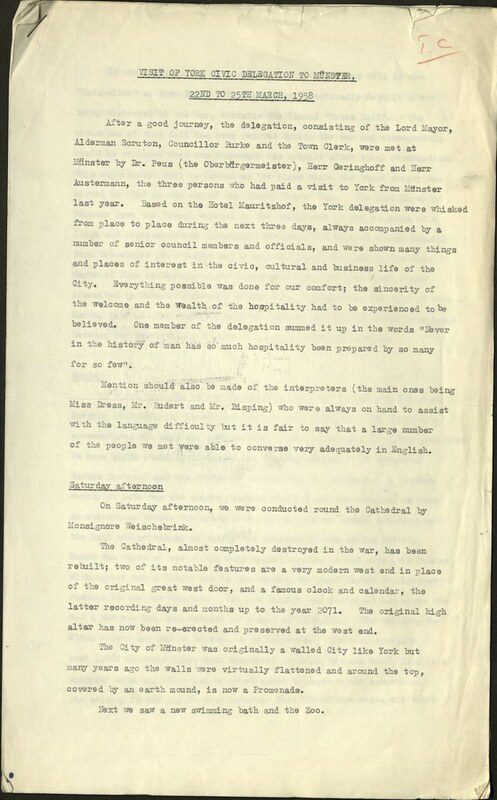 Page 2 of a report written by the Town Clerk about the first visit of a York civic delegation to Münster in March 1958. Page 3 of a report written by the Town Clerk about the first visit of a York civic delegation to Münster in March 1958. 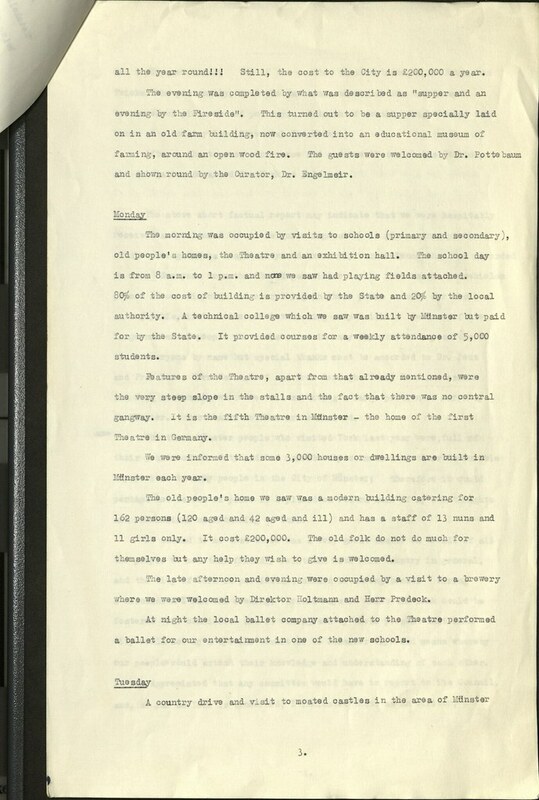 Page 4 of a report written by the Town Clerk about the first visit of a York civic delegation to Münster in March 1958. 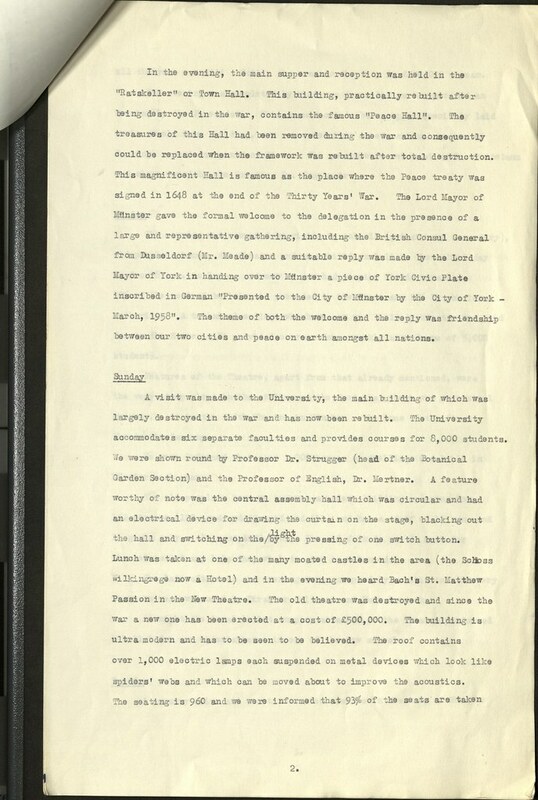 Page 5 of a report written by the Town Clerk about the first visit of a York civic delegation to Münster in March 1958.